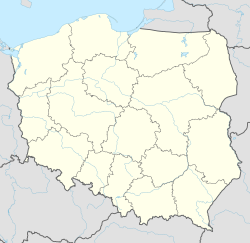 Stary Sącz [ˈstarɨ ˈsɔnt͡ʂ] - is a town in Lesser Poland Voivodeship, Poland, seat of the municipality Stary Sącz. It is one of the oldest towns in Poland, founded in the 13th century. Stary Sącz is located in bottom of the valley called Kotlina Sądecka, between two rivers - Dunajec and Poprad, at an altitude of 320 metres (1,050 feet) above sea level. The history of the town dates back to the early Middle Ages when Duchess Kinga (Kinga of Poland) the daughter of the King Béla IV of Hungary and the wife of Duke Bolesław V the Chaste, received the land called Sącz, together with surrounding villages, from her husband in the year 1257. It is assumed to be the date of the town foundation. Indeed, the Duchess must have loved the mountains very much, since she founded a Convent of the Poor Clares there in 1280 and she became its duchess herself. Almost at the same time, on the opposite slope of the Sącz hill, the seat of a Franciscan order was established also by Duchess Kinga. In the year 1358 the town received a privilege of the Magdeburg law, confirmed by King Casimir III the Great. An extremely advantageous location, on a very busy trade route to Hungary, fostered the town’s rapid development. However the town was often damaged by disasters, of which fires were the most harmful. The town also did not manage to escape floods, plagues and wars. During the biggest fire, in 1795, almost all the town has burned down. - The Yellow Route – from the railway station in Stary Sącz via Moszczenica, Przysietnica into the Radziejowa range, where, on the Przehyba summit (1175 m), it joins The Red Route heading towards Krościenko. - The Blue Route – begins at the railway station in Barcice and via Wola Krogulecka climbs the Makowica summit (948 m). A very popular bike route goes from Stary Sącz to the Przehyba summit via Gołkowice and Skrudzina. Wikimedia Commons has media related to Stary Sącz. This page was last edited on 31 December 2017, at 20:06 (UTC).